Sakya Monastery locates about 127km from west Shigatse on the way to Tingri. So, if you travel to Tibet for Everest Base Camp tour, you can visit it along the way. It is the ancestry monastery of Sakyapa, the white sect of Tibetan Buddhism. In 1073, Konchok Gyelpo built it. He was a descendant from a noble family in Tibet, Khon family. And he founded Sakya school. In 13th and 14th century, Sakya Monastery governed the Tibetan Empire when the Mongol of Yuan Dynasty governed the mainland of China. However, after the downfall of Tibetan Empire, other schools like Kagyu and Gelug started to grow and now Gelug school is the most influential school in Tibet. 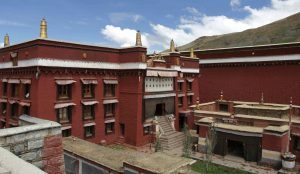 Sakya Monastery witnessed the history of Tibetan Empire and Central Government in Yuan Dynasty. Therefore, there are many valuable culture relics in it, especially scriptures, Buddha statues, frescos, etc. So, people give it the reputation of “Second Dunhuang”. The monk in the monastery told us the total area of the Main Assembly Hall reaches over 5,700 square meter. And the height of the main hall is about 10 meters. From what he said, we could imagine such a grand Buddhist Monastery. 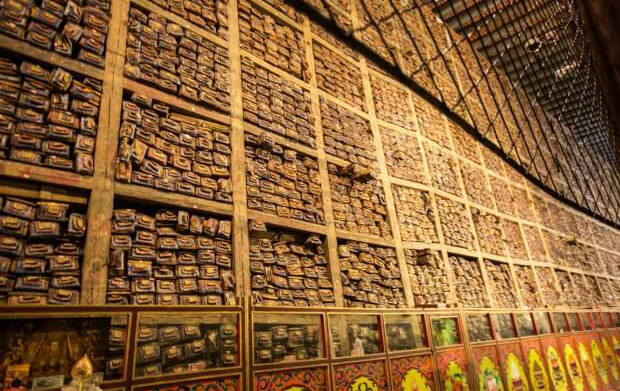 The most astonishing part of the mail hall is over 80 thousand Buddhist scriptures on display. 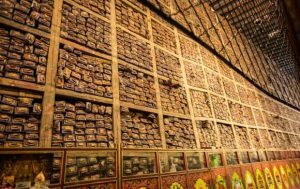 That is the world-famous Buddhist Scriptures Wall of the height of 10 meters and the length of 60 meters. The wall reaches the top of the main hall from the ground. 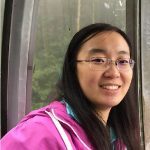 This is unique in China and even in the world. If we only check the catalogue of all scriptures, we need at least 100 years. For more Tibet Buddhism or Tibet travel news, please follow our Tibet Travel Blog.